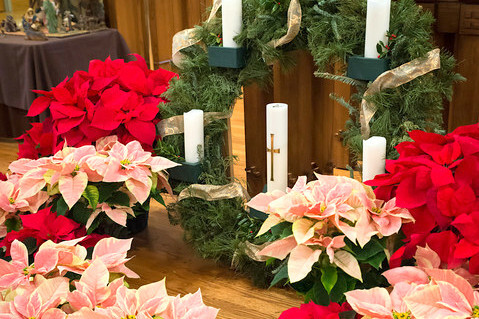 The Greening of the Church will be held on Sunday, December 23, 2018 right after the 11:15 service. The Altar Guild is responsible for preparing the church for our Christmas services, however, we always welcome the help of members of the congregation. Come and help us decorate the Altar and windows, hang the roping, and for the children, put out the crèche. We have a large space to decorate so the more the merrier! We also need fresh greenery to fill the various areas around the church – boxwood, cedar, Magnolia leaves, holly, etc. Please bring some when you come to Green the Church, or you may drop off greens on the walkway (not on the tarp) to the right of the church doors during the day of the 23rd. You can also bring them when you come to help decorate! In general, the greening takes a couple hours and Altar Guild members will be in place to offer guidance and instructions. This is a fun event so we hope you will come and join us!